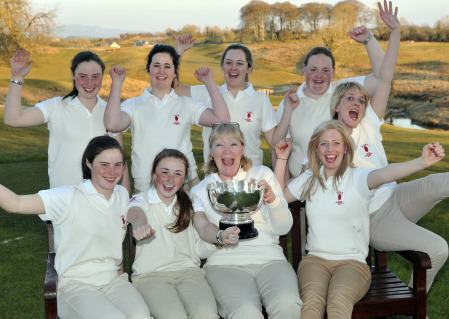 After a tense final afternoon, both teams secured two and a half points overall but Ulster claimed the glory at Castle Dargan Golf Club near Sligo. Leinster knew they needed to beat Connacht by a handsome margin in order to have any chance of retaining their title and started well with a clean sweep in the foursomes before taking the singles 5½-½ for a convincing 8½ to ½ win over the host province. Ulster needed to defeat Munster by a 7-2 margin, however Munster want to redeem themselves after Thursday’s 6-3 loss to Leinster with a 6½ - 2½ that proved to be just enough to win on the matches won rule. Sinead Sexton hits a fantastic approach to three feet at the 17th. Picture by Pat CashmanTop Munster pair Chloe Ryan and Sinead Sexton were dormie two down but birdied the 17th with a miraculous shot to three feet from the top of the rocks and also birdied 18 to halve against Leona and Lisa Maguire. Paula Grant and Jessica Carty beat Emma O’Driscoll and Laura McCarthy 3 and 2 to give Ulster a slender 2-1 lead going into the singles as Lucy Simpson and Jessica Ross drove out of bounds at the last to gift Munster’s Gillian O’Leary and Sarah Cunningham a halved match. Reeve Whitson won both his matches for Ulster on the opening day of the Interprovincial Matches at Royal County Down. Picture by Pat CashmanUlster put down a marker on the opening day of the Interprovincial Matches with a crushing 9-2 win over Leinster at Royal County Down.